Bachelor of Technology (Oil Technology) or Bachelor of Engineering (Oil Technology) from a recognized University or Institute; or (ii) Bachelor’s degree in Science with a Post Graduate Diploma in Sugar Technology from a recognized University or Institute. A person shall not be eligible for appointment by direct recruitment to a duty post in Grade III, unless he holds a Degree in Law of a recognized University or equivalent and unless he has been a member of a State Judicial Service for a period of not less than ten years or has held a superior post in the legal department of a State for a period of not less than ten years or a Central Government servant. Certificate of competency of marine Engineer Officer Class-I(Steam or Motor or Combined Steam and Motor) as specified in Section 78 of the Merchant Shipping Act,1958(44 of 1958) or equivalent as specified in section 86 of the said Act and five year’s Service at sea of which one year service as Chief Engineer or Second Engineer. For Age Relaxation, Please refer the official Notificationசம்பளம் :1. Junior Technical Officer - Level-7 in the pay matrix as per 7th CPC. 2. Junior Scientific Officer - Level-7 in the pay matrix as per 7th CPC. 3. Scientist ‘B’ - Level-10 in the pay matrix as per 7th CPC. 6. Principal Officer -Level-14 in the pay matrix as per 7th CPC. 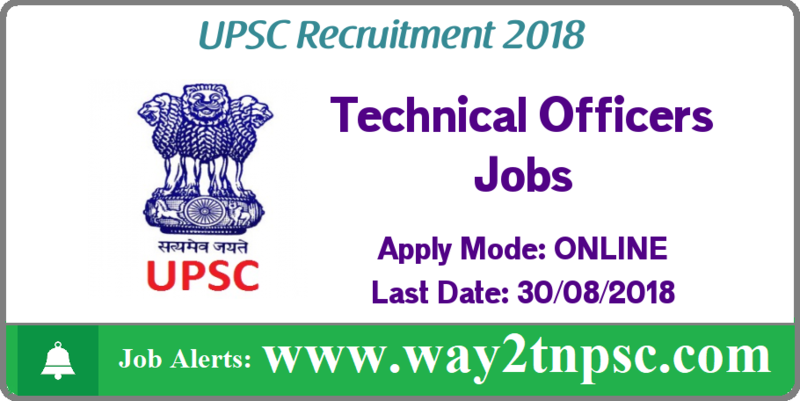 Click the FACEBOOK ICON below To get Alerts of All Job Notifications from WAY2TNPSC Interested and Eligible Candidates can apply before 30-Aug-18. Keep on reading this page to know all the above details. So, it will be helpful to know the procedure and details for the candidates who wish to apply for this particular vacancies. For Age Relaxation, Please refer the official NotificationSalary :1. Junior Technical Officer - Level-7 in the pay matrix as per 7th CPC. The above Notification ( UPSC Recruitment 2018 for 34 Technical Officer posts | Apply online ) briefly describes about the details of latest announcement or notification includes important dates like release date , last date of application submission, details regarding fees, exam timings. Candidates, check all the needs and apply accordingly.